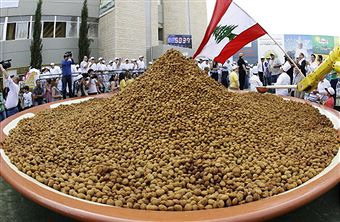 Over the weekend in Lebanon, world food records of national importance were broken in a one-two punch. On Saturday Lebanese chefs prepared the world's largest amount of falafel (5,173 kilos or 11,381 pounds), and then on Sunday chefs prepared the world's largest amount of hummus (10,452 kilos or 22,994 pounds). They even used a robotic arm to mix it! This is a matter of national pride, as falafel and hummus are objects of a gastronomic and cultural battle between Israel and Lebanon. National identity is at stake! In October 2009, Lebanon took the world hummus record at 4,500 pounds, only to see Israel take the record in January 2010 with 5,000 pounds. The latest Lebanese attempt more than doubled the Israeli record. Lebanon accuses Israel of "stealing" traditional Arab dishes like hummus and then marketing them around the world as being Israeli, with Lebanon seeking approval from the European Union to register hummus as a national dish much like Greeks and feta cheese. Others claim that "hummus is a centuries old Arab dish — nobody owns it, it belongs to the region." Guess there's only one way to decide, and that's by making enormous, multi-ton piles of it.